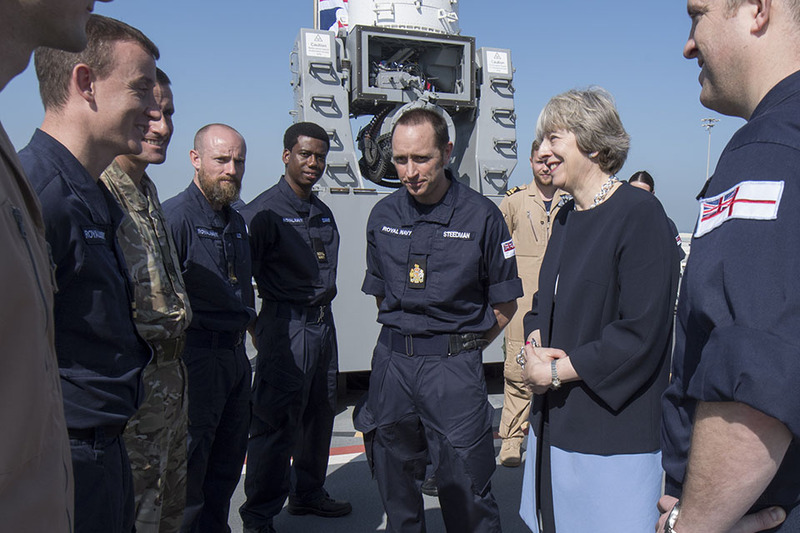 Prime Minister Theresa May spoke to the Royal Navy personnel serving on HMS Ocean in Bahrain to thank them for their vital work in the Gulf. And it’s a proud one too as I have the privilege of talking to you – our brave men and women who put yourselves on the line to keep our people safe and protect Britain’s interests around the world. Britain takes enormous pride in our Royal Navy – known the world over for its professionalism and expertise – and for the dedication and courage of its sailors, Royal Marines and officers. And I am delighted to see and hear for myself the terrific work you are doing out here where more than ever Gulf security is our security. This week I am in Bahrain to attend the Gulf Co-operation Council to reaffirm our partnership with the GCC countries, and to step up our defence and security co-operation to keep British citizens safe at home and abroad, and to ensure the stability necessary for global and UK prosperity. Here on HMS Ocean all of you are a vital part of Britain’s global mission and your role in our commitment to security in the Gulf could not be more important. As prime minister one of my first acts was to commit to Britain’s long-term security and back the renewal of our nuclear submarines. But today I am primarily here to hear first hand about the work you do. And the most important thing I have to say is a heartfelt thank you on behalf of our country for your service and your sacrifice. Your commitment to our country is unfaltering – and in return we owe you the same deep commitment and unflinching support. Perhaps more than any other this time of year brings home the extraordinary sacrifices made by you and your families. So on behalf of everyone back home in Britain, let me say once again a huge thank you.